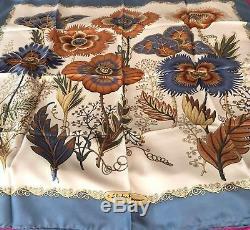 Authentic Salvatore Ferragamo 100% silk scarf flower theme, creme, soldier blue, salmon, green. 34"x34" Vintage Made in Italy. The item "Authentic Salvatore Ferragamo 100% Silk Scarf Blue/Creme, Flower Pattern" is in sale since Saturday, March 24, 2018. This item is in the category "Clothing, Shoes & Accessories\Women's Accessories\Scarves & Wraps". The seller is "jrosencookie4" and is located in Boston, Massachusetts.